IndiGo, which has shown interest in buying Air India's international operations, is actively considering alternate plans to induct at least 50 wide-bodied planes for overseas flights, said two people close to the development, as the divestment of the state-run carrier may take a while. "Right now, it's an optimistic 50-50, but the processes are slow. The airline will wait for four-five months and then implement Plan B of inducting its own fleet of wide-bodied planes," said a person aware of the matter. A second person confirmed initial discussions are on with Airbus. IndiGo currently has a fleet of 143 Airbus A320 and A320neo planes and an order for over 400 more. Both persons cited above confirmed that the order for wide-bodied planes would be over and above this. The carrier has the option of ordering the 250-plus-seater Airbus A330-800neo, which has a list price of $255 million (Rs 1,658 crore). The airline would likely get deliveries of this from 2019, said the second person cited above. Another option is the 270-seater A350-800 priced at $275 million (Rs 1,787 crore), which would be delivered after 2021. No decision has been made yet, both people said. The airline has in the past said it will shift to the outright purchase of planes from the sale and leaseback (SLB) model as the former is more cost-effective. Indigo has added a new A320NEO to the fleet today, as VT-IVA. Indigo has added a new A320NEO to the fleet today, as VT-IVB. Indigo has added a new A320NEO to the fleet today, as VT-IVE. The speed of additions of the A320 neo is crazy. I am assuming that they are also removing the older A320. Or are they doing capacity additions? Indigo has added a pre-owned A320 to the fleet, as VT-IHN. a very recent photo of VT-IHP with LZ Bulgarian registration. Not sure if they are to or from lesor. Indigo has added a new A320NEO to the fleet today, as VT-IVD. This bird is from BoCA (Bank of China Aviation). Indigo has added a pre-owned A320 to the fleet, as VT-IHO. IndiGo today commenced its regional jets ATR operations, with the maiden flight taking off from here to Mangalore. The first flight of the ATR plane took off from the Rajiv Gandhi International Airport here this morning to Mangalore, the airline said in a release. By December 2019, IndiGo, with its fleet of brand new 21 ATRs, would have connected about 15 tier-II and tier-III new cities on its network, thereby giving a big boost to regional connectivity, the airline's president and whole-time director, Aditya Ghosh, said in a statement. "With more ATRs joining our fleet in the months to come, we are much closer to realising the dream of the common man," he said. "The IndiGo network will expand not only to provide connectivity between these smaller cities, but our strong network of domestic and international markets will also open up immense connectivity to and fro for these smaller markets," Ghosh said. Elaborating on the expansion plan, IndiGo's chief commercial officer Sanjay Kumar said on January 7 and 9, the airline will be commencing its second and third ATR operations, adding Tirupati and Rajahmundry on the network respectively. He also announced four new domestic flights from Hyderabad, which include an additional Hyderabad-Lucknow- Hyderabad flight, a new Hyderabad-Ranchi-Hyderabad flight, an additional Hyderabad-Jaipur flight and a new Hyderabad-Jammu via Jaipur flight. Indigo has added a new A320NEO to the fleet today, as VT-IVF. I know I haven't been posting around here for a while but lurking for sure. Wanted to share the interesting experience with Indigo's first ATR flight yesterday. I loved the legroom. Indigo has added a new ATR72-600 to the fleet today, as VT-IYB. All very well and good but rather pointless if this airline still does not provide seamless connectivity on its domestic routes and still expects its passengers to check in for the connecting leg during transit. Do you have any evidence of that..? If you say so, for international connections with indiGo - then yes, I’d agree. But you keep spouting that as fact for all flights - to which even indiGo’s own website disagrees. IndiGo on Saturday said that it has become the first Indian airline to operate "1,000 plus flights in a day". According to the airline, its flight 6E 185 from Mumbai to Kochi operated on December 22, 2017 became the 1,000th flight. "IndiGo also took the delivery of its 31st Airbus A-320 Neo aircraft on the same day to join its ever growing fleet making the first Indian carrier with a 150 aircraft fleet," the company said in a statement. The evidence is in my own experience from last year. I don't know if they have changed their policy. The Indigo website does not mention anything. Would appreciate it if you could show it to me. 5. Can I interline my IndiGo flight with other domestic and/or international airlines? On certain specific and select sectors, IndiGo offers connectivity between two IndiGo operated flight segments ("Connected Segments/Routes") (by way of example, Chennai Kolkata Guwahati, in which case, Chennai is the point of origin, Kolkata, the point of transit and Guwahati, the final destination). Any bookings with respect to the Connected Segments/Routes shall be required to be booked in advance and both segments in the the Connected Segments/Route shall be confirmed on the same PNR or Confirmation Number and will be identified by a single surcharge component. Indigo has added a new ATR72-600 to the fleet today, as VT-IYC. Indigo has wet-leased an A320 (LY-ONL) from Small Planet Airlines. In 2015, I had written how IndiGo was doing a smart thing by converting its 30 A320ceo on order to the A320neo. Back then, it was assumed that Pratt&Whitney will deliver the Pure Power engines on time without glitches. Unfortunately, what has followed since has affected fleet expansion and fleet renewal plans of every airline which had the A320neo powered by PW engines on order. IndiGo, today, started operations with wet-leased aircraft from Small Planet Airlines. A total of four A320s from Small Planet are now in New Delhi. LY-SPB, an 11 year old A320 which landed in Delhi on 25th November and has been idle for a month is the first to take to the skies flying as 6E 377 to Kolkata. The flight was delayed by close to two hours. 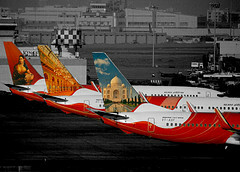 LY-SPA (15 years), LY-ONJ (7 years) & LY-ONL (7 years) are the other aircraft currently in India. All three flew in from Vilnius, Lithuania on 18th December, 29th November and 26th December respectively. These aircraft have all come from the Lithuanian subsidiary of Small Planet Airlines – which specialises in charter operations in Europe. Indian low-cost carrier IndiGo later this month (January 2018) plans to offer service to Sri Lanka, offering nonstop flights to Colombo on board Airbus A320 aircraft. Planned schedules as follow. Indigo has added a pre-owned A320 to the fleet today, as VT-IHP. Indigo has added a pre-owned A320 to the fleet today, as VT-IHH. India’s most profitable airline IndiGo will launch low cost flights to major European cities from next winter- the first Indian airline to follow an increasing global trend of long-haul-low-cost operation. IndiGo has sought regulatory approval to operate flights to London, Paris, Hong Kong and Madrid from New Delhi with Airbus A330 aircraft. According to a senior IndiGo official, the airline will initially start with direct flights to these cities and price them at least 30 percent lower than prevalent rate. “The low cost structure of IndiGo makes it ideal to offer a long haul service. An airline’s cost is primarily fuel burn, aircraft acquisition cost and labour cost all of which are one of the lowest for IndiGo,” he said. IndiGo’s expense of operating one seat for one kilometre (CASK) is Rs 1.94 while the same for its low cost rival SpiceJet is Rs 2.33. Among the global LCC majors, American airline Southwest burns Rs 3.52 while Ryan Air in Europe spends Rs 1.45. So it is official now. Indigo will fly to Europe and Hong Kong from next winter. All the flights are from DEL. I would really urge them to provide seamless connections and through check-ins on their network. It is one area where they are falling behind the competiton big time, IMO. IndiGo today announced the appointment of Wolfgang Prock-Schauer as its Chief Operating Officer. He will oversee flight operations, maintenance, engineering, in-flight and airport services for the airline. "I am very pleased to take up this new role at IndiGo and excited to be part of the dynamic team which has delivered such a consistent product for more than a decade," Prock- Schauer was quoted as saying in a statement. "I look forward to working with the team in areas that can strengthen IndiGo's operations," he said. Prock-Schauer, who was the CEO of GoAir for over two years in his previous stint, has more than 36 years of experience in civil aviation. He has held senior leadership positions with Jet Airways, Austrian Airlines, British Midland International and Air Berlin. Will they charge for meals like they do in domestic routes. Also they don't have any interlining with any airline so have to rely primarily on O & D from India. And yes they don't have good seamless connections and have to improve it vastly. LHR will be a problem, since they don't have any slots, perhaps they may try to fly to LGW. How are they going to cut costs? They will still have to spend on crew layover. If they charge for meals, they rather include it in the ticket as almost everyone will buy, unless you expect passengers to pack "aloo puri" with them. One thing they can do is reduce the meal choices, if that saves some money. Interline arrangements can be done anytime before resumption of flights. Any idea if Air Asia X or Norwegian have meals included in the ticket? Good they are early takers of this new trend of low-cost global airlines. Norwegian - does NOT include meals in the ticket for the base level. For the BOS-LGW ticket that I recently booked, the LowFare was $169, LowFare+ was $249. LowFare+ = LowFare + Seat choice + 1 piece of checkin luggage + free meals. If anyone does book Norwegian, using the Norsk language choice the fare is around 20% lower than using English. I believe meals will be included with the ticket price. Don't know about alcohol though. And they are going to be flying to LGW and ORY, to avoid the higher charges in LHR and CDG. They are most certainly going to rely on the cheap VFR crowd (to London) and the 'Europe in two weeks for INR 150,000' package tour types (to Paris and others). I really wonder what their seating config is going to be though. I sincerely hope they don't go the Air Asia X way and put in 3-3-3 in Y.
for interline, you have AA at LGW and Easyjet at ORY. Enough for North America and Europe bound passengers. Don't know whether Norwegian will connect to NA directly or via their hub. Else, a very good option. I think Indigo will need to offer a base Veg snacks meal for free (otherwise people will pack all sorts of crazy things). They can then sell upgrades to real meals and non veg meals. Hopefully they join with AA & BA. One world needs a partner and I think Indigo would be a goof fit especially since OW has LEVEL airlines. Indigo should try and match them as much as possible. Maybe fly to BCN and connect to Level. So long haul low cost to long haul low cost. Plus OW has their LLC in BCN as well. For a flight of 7 hours+ duration, they are going to have to serve a full meal and a pre-landing snack. It won't be a big drain on their profits if they include that in the ticket cost. They can sell special meals and alcohol if they wish. From BCN, Level flies only to BOS, EZE, LAX, OAK and PUJ. That's not very many destinations, and of these, only BOS, OAK, and LAX are likely to get any meaningful traffic from India. They fly to even fewer places from Paris ORY, the only meaningful destination from the Indian perspective from there being EWR. From LGW they can partner with BA/AA/Vueling, Norwegian (including trans-atlantic routes), EasyJet and even Virgin Atlantic. I don't know whether things have changed, but the last time I flew to LGW, I swore I would never use the airport again. It was absolutely shambolic and made the 1990s Sahar International look like it was run by Bavarians. Quite likely oneworld may approach Indigo to join. And for Indigo it would be beneficial if they are planning to fly to Europe. As far as meals, they cannot afford to give more than one light meal, additional snacks/full meals will be a drain in profits, they will sell regular/special meals and snacks on board. AirAsia sells meals on all sectors including long haul. Not even water is free on AirAsia. IndiGo is venturing into the global market, expanding its reach to various European cities in 2018, while also looking to fly to other countries not so far from India. Interglobe Aviation, the operator of budget airline IndiGo, has sought the aviation ministry’s approval for flying to key European cities. The airline hopes to start flying to the European cities of Frankfurt and Paris, and to Gatwick, Manchester and Birmingham in the UK, starting October 2018, as part of its global expansion plans. There are also plans to reach Brussels, Rome, Milan and Zurich in 2019. As per media reports, IndiGo said it is open to inducting aircraft such as Boeing’s 777 and 787 for its expanded international operations. The largest Indian airline by passengers carried, IndiGo also plans to reach Vietnam, Malaysia, Myanmar, China, Brunei, Thailand, Singapore and the Middle East, and plans to use its existing update for some of these short-haul international destinations. The airline is still waiting to reach Dubai and looking forward to a solution on preferential allocation of slots for Indian carriers at the airport there and waiting for any increase in bilateral rights. IndiGo also shared its plan to induct Airbus 321s, which will be deployed on flights to Bahrain from New Delhi and Mumbai and to connect Chennai and Ahmedabad with Kuwait during the summer schedule, which begins in March and ends in October.